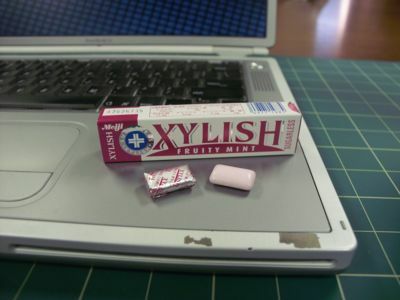 Today we retreat back to the world of Xylish gum. This is the last flavor of Xylish that I am aware of and it’s probably the last of the flavors I reviewed because…Fruity Mint? Yikes. Fruity? Mmmm, tasty. Mint? Biggest fan right here babE! Fruity Mint? Hmmmm. It’s not a combo I’d deliberately choose for any sort of flavoring. In fact, it’s probably a combo I’d label as “quaint” or “Odd” and I might even go so far as to think “bizarre”. But! I try to jump into these things with an open mind, or at least a mind that has brain spanners firmly affixed and cranked to their widest setting so here it is: Fruity Mint? Yikes. Alright. It’s not so bad in its elemental parts. Starting with a 0 pea rating and working from there I’ll begin with the fruity. Y’all might be shaking your head and saying, “But boo! What about the Xylish Citrus Green? Isn’t that fruity as well? Well…yes but citrus fruity and berry fruity are two entirely different fruities when you are talking about adding mint. Trust me. The berry fruity of Fruity Mint is a very nice fruity berry fruity indeed. I’ll give it 2 peas for achieving “fruity” because it does that. Mmmm, fruity. However, it also does mintholated and berry fruity and mintholated just do not mix. Badmovie may try to convince you otherwise but stand firm in your belief that berry fruity and mintholated were never supposed to meet like this. Negative 1 pea for competing coexistent flavors. You can tack on half a pea point for staying power of both the mintholation and the fruity berry flavor. I was…well pleased would be the word to use if I liked the fruity berry mintholation experience but I’m not sure there is a word in the English language that means, “If I wasn’t fervently hoping one of these good flavors would cut out and just leave me with a single delicious chewing gum flavor instead of the current disturbing bizarre-o combo gig they have going, I’d actually enjoy how long the flavors of both parties are lasting”. That word, whatever it would be. Use it to describe the flavor, it’s worth the half pea for at least succeeding at making a long flavored gum. So far, we are running at 1.5 peas. Tack on another full pea for crunchity because crunchity makes a boo happy. Happy boos give JSFs a pea point just on account of making a boo happy. Plus, crunchity. I love me the gum crunchities and Xylish Fruity Mint delivers. Mmmm. Lastly, tack on a pea point for construction and packaging. Like its brethren Xylish flavors, Fruity Mint has the same box-in-a-box packaging intriguenuity and neat wrappering of the individual pieces. Add a final half pea point for Xylish being sugarless on top of everything else and it would almost get a 4 pea rating. Almost. I’m going to have to take a half pea point off for the strange chemical taste that seems to plague some of the Xylishes (Xylishi?) for alas, Fruity Mint is plagued with the phantom chemical flavor. There is just a hint of processed around the edges. It’s not a player, but it is there just enough to peripherally poke at your taste buds. However, 3.5 peas is not bad at all given that I really don’t think the two tasty yet incompatible flavors work for this gum and neither flavor seems like it’s willing to drop out and let the other flavor carry the gum onto greatness. So this will have to do and Xylish Fruity Mint will have to settle for a Rating of 3.5 Wasabi Peas out of a possible 5.